Beginners Metal Detecting 2019 - Your complete guide to the hobby! I decided to write the ultimate beginners guide to metal detecting for numerous reasons. Firstly I wanted to put all of the information you may need in one place to help save you some time. When you’re just starting out there are always lots of questions you require answers for. I remember when I was a beginner and things got a little overwhelming, what detector do I buy? how does it work? where should I go? what are the laws? These are but a few of the questions that I wanted answers for. Secondly, I want to help you, the beginner to understand the metal detecting world better. Both those who haven’t yet started or those who have just begun. I’ve always had a passion for history and as strange as this sounds felt like I was born into the wrong era. Like I have some deep connection to another time and place. Metal detecting for me is the closest thing to a time machine. Sometimes when I am alone in a field with my metal detector I can almost hear and see a time gone by. There’s nothing worse than having your metal detector there and being stuck in limbo. Not knowing where to go, what to do or how to do it. Hopefully, this guide will give you a better insight into metal detecting and help you begin your journey into this wonderful hobby. If I have missed anything you can simply let me know in the comments or via email. If it’s relevant and important I will be sure to include and credit you for the additions. I have also converted this guide into a free Ebook, if you would like a copy then please goto the contact page and fill out the form, once I get your message I will send you it over personally. If you do have time to read this guide now, great. Grab yourself a cuppa and let’s begin! If I were to define metal detecting in just one sentence then it would be the act of recovering a lost metal object using a metal detector. However, there is so much more to this wonderful hobby. You wouldn’t believe what people have lost and just how much over years past. Starting thousands of years ago coins, jewellery, relics and just about anything you can think of has been lost. These metal objects then sink into the ground that they are dropped on and over time disappear. Metal detecting enables anyone to recover these items that were once lost. Metal detecting allows us to discover information about our ancestors and history. There are many reasons why one may choose to go metal detecting due to the huge number of benefits it has to offer. Yes the Buzz, the adrenaline buzz of the metal detector in your hand beeping away showing a good signal! Not knowing what you have found, the hope that it’s something exciting, preferably GOLD or a lost hoard of coins! The only way I could better describe this is it’s a similar feeling to gambling when you’re so close to a big win. 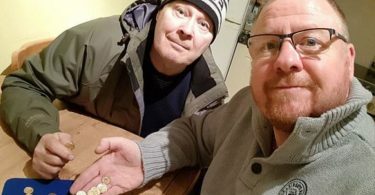 Some may choose to join a local metal detecting club where they can meet like-minded people who share the same interests as them, many lifelong friendships have been started from socialising at a metal detecting club. There are clubs for just about every area of the UK and these clubs bring together a number of people who want to enjoy the hobby. These clubs allow us to socialise and make new friends. Health and fitness are probably two of the top reasons I metal detect. Being at one with nature and taking in the beautiful views are very good for your mental health. You will also find that when you are out there in the field or on the beach detecting you are naturally escaping the day to day pressures and stresses of life. While I am out metal detecting it’s very rare I think of anything other than metal detecting. It’s a great escape. Not only will your mental health improve but your physical health & fitness levels will too. You would be amazed at just how many miles you walk without realising and digging all of them holes works the muscles nicely. If you get yourself out once a twice a week to metal detect your fitness levels will inevitably increase. I was metal detecting that much at one point I actually managed to tone up and could see a clear difference in my physique. A passion for history is enough to interest someone in the hobby of metal detecting. It’s not just about getting out there and uncovering old items. It’s the research and the education. Many people enjoy the research that goes hand in hand with the hobby just as much as being out on the actual hunt. Researching your permissions before you visit them, the area, the town or village you will learn a lot about the local history. Researching your finds after you’ve been out again will teach you a lot about history. For many it’s the history that drives them more than anything. I decided to create a poll on a popular Metal Detecting Facebook Group to do some research. Metal detectors transmit an electromagnetic signal from the detector search coil straight into the ground. Any metal targets that are picked up by the electromagnetic signal are charged (energised) and in turn transmit their very own electromagnetic signal. The search coil then receives the targets electromagnetic signal and then sends this signal to the control box which will alert the operator with information. Some metal detectors will allow the user to change settings to discriminate against different metals and target types. Allowing the user to ignore different types of metal. How the metal detecting components work together. The Battery gives power to the metal detector. The control box is the brains of the detector. It contains all of the electronic and is where the transmission field(signal) is created. The information of the signal which is received is also processed here. The search coil creates the electromagnetic signal which is sent out to the ground. It also receives the electromagnetic signal which is created from the metal target in the ground. The Target is the metal object located in the ground. This, when charged, sends the electromagnetic signal back to the coil. How does the frequency of a metal detector work? Metal detectors are created in various frequencies, some are set to a single frequency, some allow multi frequencies. A single frequency metal detector that runs at a high frequency generally speaking will be more sensitive to smaller targets but will not go as deep. One that runs at a low frequency will add depth capabilities and will detect larger targets. There is now technology available which allows metal detectors to transmit multiple frequencies simultaneously which in turn allows the metal detector to be effective for small targets and deep targets. Although there are many metal detectors available, and each one is slightly different sporting different features and technology. The components are almost all the same. The majority of metal detectors can be broken down into just a few simple pieces. The following diagram will help you understand how a metal detector functions and the components it is made up of. By no means does this section cover every single word or term used in the metal detecting world but I’ve tried to include the more popular ones to help you understand the meanings. All Metal – A setting and mode on a metal detector which does not discriminate against any type of metal. Audio ID – Some detectors will allow you to identify the target by the tone. This is audio ID. Concentric – A type of search coil with two circular coils that are tuned to each other, these produce a cone-shaped search field. Detectorist – A word to describe someone who partakes in the hobby of metal detecting. Discrimination – A feature on the majority of metal detectors that allows you to ignore unwanted items. For example, ring pulls and iron. Double D – Commonly known as wide scan, a type of search coil that, contains two balanced coils in the shape of D.
False Signals – Also known as ghost signals. These signals are caused by machine malfunction, mineralisation, wet sand and more. The machine gives off a positive signal telling you there is a target which doesn’t exist. Ferrous – Items that are made of iron. Frequency – A hertz measurement of the current which a metal detector is running in. Ground Balance – A feature which allows the metal detector to neutralize the mineralisation in the ground. Masking – When a non-ferrous object is hidden behind a ferrous object. Mineralisation – Minerals which naturally occur in the ground. These minerals can cause the metal detector to become unstable and cause loss of optimal performance. Non-Ferrous – Items that do not contain iron. Gold, Silver, Bronze are all examples. Pinpoint – A feature on some machines that allow you to pinpoint the target in the ground. Pinpointer – A small separate metal detecting hand-held tool which allows you to search the hole and locate the target. It beeps when it is near metal. Reject – The ability to ignore unwanted targets in the ground. Also commonly known as discrimination. Signal – When you pass over a metal object in the ground with your metal detector a signal is received and your metal detector will make a sound. Shaft – Sometimes known as the stem. The rigid pole or tube in the center of the metal detector which connects the coil and control box. Target – The metal object located in the ground which produces a signal for the metal detector when passed over. Threshold – Threshold settings are available on some more advanced metal detectors, this is the optimal point of tuning in which a faint tone can be heard. Tracking – A feature of some metal detectors which can be turned on to continuously scan the ground and conditions and mineralisation, the machine will then auto adjust the ground balance to optimal settings. Trash – Bad finds like nails, ring pulls, foil or tin cans. Visual ID – A meter displayed either on the LCD screen or in analog which gives more information about the target in the ground. Sometimes displayed by numbers. Throughout this guide and perhaps in other articles, information, and discussions you may read slang words that you are unfamiliar with. There are many unfamiliar metal detecting slang words that we use in the detecting world and I hope that the following will help you better understand what these words mean. 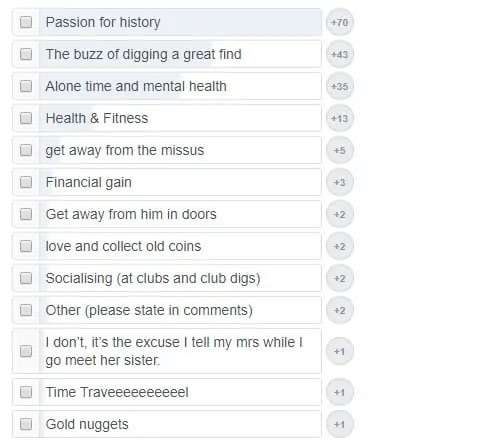 Credit again goes to the metal detecting facebook group community for these slang words. If you are a beginner I would highly recommend you join this group here. Bullhead – George III coin. Bunhead – Victorian Coin referring to the young portrait. Carrott – A bright orange pinpointer tool by Garrett. Chatter – A sound that the detector makes when running in full sensitivity. Coinball – A ball of soil or earth containing a coin. Crud – A hard layer or crust stuck to a coin. Greeny – A worn smooth Victorian, Georgian, Or Edwardian Copper coin. Grot – A worn Roman Bronze Coin. 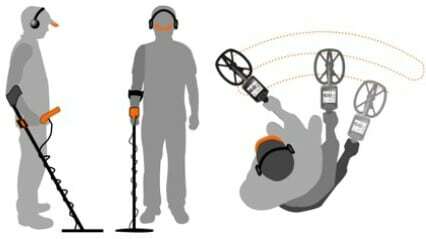 Grunt – The sound a metal detector gives off for iron signals. Hammies – A Medieval type of coin. Hammered coins were created by hammering. Moo Tube – A common find in a farmer’s field. Moo tubes show up as a very positive signal. Moo tubes are waste ointment tubes that were used to treat Mastitis in cattle. Night Hawking – An illegal form of metal detecting done mainly at night time without permission. Permissions – Land that you have permission from the landowner to use your metal detector on. Plug – The hole that is dug to recover a target. Swing/Sweep – The motion of swinging or sweeping your metal detector side to side scanning the ground. What do I need to get started metal detecting? This goes without saying you’re going to need to purchase your metal detector, before you quickly leave this guide and go and purchase one be sure to read the section on choosing the right metal detector for you, and what is the best metal detector. The last thing you want is to be out on a hunt and for your metal detector to run out of power cutting your day short. I always carry a fresh spare set of batteries. I learned the lesson the hard way. A good tip for saving money is to purchase some rechargeable batteries and a charger. OK, I have written mandatory for headphones however you can go metal detecting without headphones. Once you have done this you will see why I have written mandatory. Metal detectors work without headphones and have an internal speaker which will alert you when you have found a target. This loud beeping speaker can be rather annoying and intrusive to people around you. You will also find wearing headphones you can hear the tones more clearly. The tones give a lot of information on what you have found. Check out the best metal detecting headphones for our top 5 choices in metal detecting headphones. We’ve tried to include something for all budgets! You will need a suitable digging tool. There’s a section later on in this guide which recommends some of the best digging tools for metal detecting. A suitable pair of boots are a must have, be sure they fit well, are comfortable, are preferably waterproof and most importantly are not steel toed. Yes, again when I was a beginner I learned the hard way and spent hours digging absolutely nothing from the signal given off by my steel toe caps. You will need a finds pouch especially if you don’t want to lose what you have found. I use a bum bag with different sections. Use the different sections to separate your junk from your treasure. Simply putting the finds in your pockets is a disaster waiting to happen you will soon find that you lose something when digging or moving around later on. Check out the best find pouches and bags. Self-explanatory you are going to need permission to go metal detecting on someone’s land, or you can head off to the beach with a crown permit. Consider the weather, if it’s cold wrap up warm but ensure you don’t restrict your mobility. Waterproof if it’s looking like rain. If it’s warm loose-fitting clothing that doesn’t cook you. I have again written mandatory next to insurance because I believe it’s better to be safe than sorry. A membership with the NMCD or the FID will give you full PLI insurance. I discuss metal detecting insurance in depth further into this guide. You’re going to need a positive attitude and patience. Don’t expect to go out on your first day and find treasure or something significant (although it has happened) Until you get used to your equipment you will find that you spend a long time digging junk. Persevere stay positive and you will be making good finds soon enough. Most metal detectors these days will have a pin-point feature built in however some don’t. It’s not mandatory that you have a pinpoint feature or a pinpointer. However, this will save you a lot of time when recovering targets and ultimately a lot of stress. I cover what a pinpointer is and does later on in this guide. 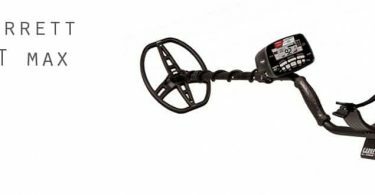 Choosing the right metal detector for you. Before you go ahead and purchase your first metal detector there are a few questions you are going to want to ask yourself. You should ask yourself this first and foremost and remember if you buy cheap it’s likely you buy twice. Always look to purchase a named brand that has a good reputation and a good support network. It’s also worth considering that 9 times out of 10 a beginner will purchase the cheapest gear possible only to realise that it’s not powerful enough. Now they’ve caught the “metal detecting bug” and want to upgrade their gear within the first couple of weeks. There are metal detectors on the market available for every beginner’s budget that are manufactured by reputable brands. So that being said decide on your budget. Try not to go above it until you decide whether the hobby is for you. Where will you be metal detecting? Are you going to be simply using the metal detector for the odd trip to the beach? Will you be hunting fields, parks, and pasture? Do you want something that can be used for all terrains? This is an important question to consider as some metal detectors excel in different terrains and some do not work as well. Without a doubt, the metal detecting market is dominated by but a few brands. Don’t get me wrong there are other brands that try and compete and some have a small amount of success with the odd metal detector release, but there are the ones that have been around for some time. These brands have earnt their credibility. I will list the brands for you to keep an eye out for along with a small amount of information about each. These are the brands that in my opinion are trusted. The brands that continue to produce reliable and effective metal detectors and deserve recognition. When starting out with the metal detecting hobby I would highly recommend your first metal detector is manufactured by one of the brands I am about to mention. One of and if not the biggest brand name in the metal detecting world. They began marketing and selling their metal detectors in 1964 and their mission was to create affordable metal detectors for any level of metal detecting experience. Producing both metal detectors for the military and the hobby, Garrett has produced some of the most popular metal detectors on the market including the Garrett Ace line, The All-terrain detectors and the Garrett Pinpointers which are indeed the most popular pinpointers available. The Garrett ACE 250 an entry-level metal detector is the most sold metal detector of all time. Garrett has a range of metal detectors for all budgets and experience levels and is a name you can trust. There is a large community of Garrett detector users and a wealth of information available. One of the world’s leading metal detecting manufacturers. They began in 1985 and have supplying metal detectors to the public and military ever since. The first machine they produced was the Goldseeker 15000 and within the first 2 years of release, they had sold over 8000 units. They then produced the GT 16000 which dominated the international metal detecting markets. Minelab designed and manufactured a large amount of the most popular metal detectors on the market today including the CTX 3030, the X-Terra Range the Safari and the E-Trac. Minelab is a brand name you can trust and they also have a large community of users. Bounty Hunter metal detectors are part of the First Texas Products group and have created a great group of brand names in the metal detecting community including the Bounty Hunter. Although a lot more popular in the USA, Bounty hunter still manufactures a great range of metal detectors across the board. They have something for everyone beginners and pro’s alike and their metal detectors are great value for money. They are again a name that can be trusted in the metal detecting world. Perhaps the most popular brand under the First Texas Products umbrella. Fisher has created a range of fantastic metal detectors that have more than proven themselves in the detecting hobby. They are created under the Fisher labs name and have been supplying the industry with metal detectors for 75 years. Some of the more popular models for the beginner include the Fisher F5 and the Fisher F70. XP is a French company established in 1998. It’s safe to say in such a short time they have earned their reputation. They created the world’s first wireless metal detector the XP Deus. The XP Deus metal detector is perhaps the most popular metal detector on the market today. Once you are started in the metal hobby you will hear this model spoken about a lot. I wouldn’t say it’s a machine for a beginner unless you are prepared to sit and read the manual and learn how to use it. Teknetics metal detectors are another brand of metal detectors released under the First Texas Products company. Teknetics detectors have a very strong user base and have created a reliable and trustworthy name for themselves. They have a range of metal detector models available for just about every experience level and the Teknetics Eurotek Pro is a highly recommended metal detector for the beginner. This is largely due to its very reasonable pricing and performance. They pride themselves on creating simple to use metal detectors while not sacrificing power. The metal detector model I believe boosted their success was the Teknetics T2. Again a reputable brand name that has been manufacturing metal detectors for 35+ years now. Tesoro is based in the USA and their metal detectors are more popular in the USA than the UK. There are still, however, a good amount of UK Tesoro users. The company tends not to focus on fancy bits like LED screens and lots of modes or buttons to press, it does not mean though that Tesoro detectors haven’t proved themselves time and time again. Another respectable and trustworthy brand that has proved itself is White’s electronics. They have been trading since the 1950’s and have a department in the USA and one in the UK. White’s produce some very impressive metal detectors and their prices are more than competitive in today’s economic climate. Last but by no means least of the popular and trustworthy brands list is Nokta. Producing hobby, military, security detectors and more it’s safe to say this company no what they are doing. It’s a brand of detector that has a strong user based in the UK and earned its place in the detecting world. Some of the more popular products include the Nokta Impact and their Nokta Pinpointer. Where can I go metal detecting legally? There are many places to go metal detecting. Some you could visit today without having to have permission, however for most of the places I will now discuss you’re going to need the landowner’s permission. This is of the utmost importance. For me personally, this is the most stressful part of the hobby. You’re going to need to be consistent and patient to gain permissions from landowners. We cover how to get permissions later on in the guide. Where can I go metal detecting without permission? Once your metal detector arrives you’re going to want to test it out. If you have no permissions secured and don’t live close by to a beach then this is going to be your best option. Most people have a garden. Family members, friends, friends of friends and even yourself. Ask around. Be sure to read the how to dig a plug section of this guide before you ruin someone’s lawn! People spend a lot of time in the gardens. Entertaining guests, playing games, gardening, strolling and more. Inevitably over the years, things get lost in the garden. Of course, the garden you search will be much more enjoyable if it happens to be the garden of an older building and quite large. The garden is a nice place to get to know your metal detector better. You can perform tests by burying objects of different metal composites and learning how your metal detector behaves when above them. Another Question I am asked a lot by people who want to start the hobby is, do you need permission to metal detect on the beach? 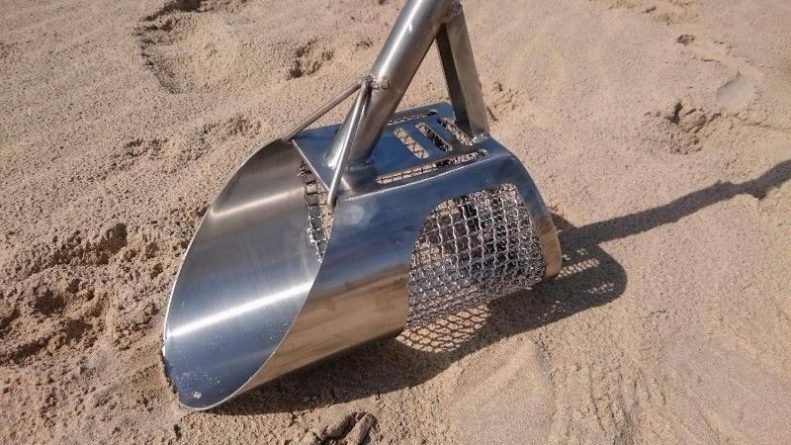 You do not require any permission to go on the beach with your metal detector, once upon a time you would have had to apply for the Crown Estate metal detecting permit but at present, this has been discontinued. Beaches are now a very common place to go metal detecting. Be sure before you go to the beach to see that it is included in the Crown Estate. Some beaches are not covered by this open permit. Check the crown estate asset map on the maps to see if you are allowed to metal detect on the beach you want to visit. The Crown estate permit does not permit riverbanks, the seabed or other Crown-owned lands. Because of the frequent traffic of beachgoers, dog walkers, holidaymakers the beaches can be full of trash and junk. However, where there has been a lot of people, over the years there have also been a lot of lost items. In holiday seasons the best time to visit the beach would be early mornings and late afternoons when there are not many people around. You can check out my full beach metal detecting guide here. Where do I need permission to go metal detecting? A lot of beginners ask me, can you metal detect in the woods? Before you wander off down to the local woods or whip out your detector on a “public” footpath somewhere you need to know that this is not permitted. Often misinterpreted the word public does not mean that the path or woodland is not owned by someone. All it actually means is that the landowner has given the permission for access to the public. You will still need permission from the person who owns the woodland or the land before you can use your metal detector there. That being said if you can secure the permission from the landowner to detecting in woodland or on public paths then you could quite easily find yourself some very interesting finds. In my opinion, the very best place for metal detecting and also probably the hardest place to secure permission. Farmers are very protective of their land, imagine if someone knocked on your door and asked if they could go metal detecting in your back garden? If you can gain a permission from a farmer then you’re going to have a great place to go metal detecting. Most treasures, artifacts, and hoards of coins have been found on a farmers field. Ploughing machinery can also help bring items closer to the surface but unfortunately can sometimes damage it also. Do not fear though if you have nowhere to go and you can’t get any kind of landowners permission there are many metal detecting clubs nationwide and no doubt one very local to you. To see a list of clubs you can visit this page here or alternatively you can do a search on Facebook. Type the area followed by metal detecting club. For example “Manchester Metal Detecting Club”. Clubs often hold weekly or a monthly metal detecting Raleigh. The club organisers have already secured the landowner’s permission so you don’t have to worry about it. Often there is a small fee to pay usually between £10 and £20 for the day. Sometimes they include a raffle and refreshments, bonus! Not only will you be out metal detecting but you will meet other like-minded people and who knows may make friends with some. If you’re lucky some of them new friends may take you on their permissions. Here’s our list of UK metal detecting clubs by area. If you are lucky and believe me most Councils will not entertain our hobby you may be able to get permission from the Local Council to metal detect on the land that they own. If you can get the permission then parks & commons are a great place for metal detecting. Over the years commons would have been used to hold events, fairs, fetes, for sporting events and more. Parks often have been around for some time and people drop things when playing. How to get permission from landowners to go metal detecting? There are numerous ways you can approach asking landowners for their permission to metal detect on their land. Some work much better than others. It all depends on how confident you are. Firstly you’re going to need to know the contact details for the landowner. Or if you’re brave enough be ready to go and knock on their door. In my opinion, it’s not the greatest way to approach the task at hand. However, for those who lack confidence, it’s the least scary way. I found that in sending letters you’re very rarely going to get a reply let alone secure the permission. That being said, you should be sure to include in your envelope a self-addressed envelope and stamp along with the letter you send just in case they wish to write back. Firstly you will need to find the farmers postal address, you can perhaps achieve this via Google search if you know the farmer’s name and rough location. The letter should be set out similar to the metal detecting permission template letter below. Be sure to add and delete the fields where appropriate. Landowners metal detecting permission template. My name is [insert name] I live in [insert area] and I have been metal detecting for [insert amount of years] years. I am a member of the [NCMD or FID] and abide by the metal detecting code of conduct at all times. I am also fully covered by public liability insurance for your peace of mind. Have you ever been interested in finding out more about the history of your land? With my metal detector, I can help uncover clues and information. The main purpose of this letter is to kindly ask for permission to use my metal detector on some of your land. I understand that you are probably very busy and this is the main reason I am writing instead of knocking on your door unannounced. So I have included all of my contact details if you wish to discuss this further or face to face. I will treat your land with the utmost respect and the holes I dig when recovering metal items are unobtrusive and always neatly backfilled after recovery. If you are kind enough to grant me permission to metal detect on your land any finds made will be reported and shown to you. I will also never turn up unannounced and always respect your privacy. Please do not to hesitate to contact me on the contact details I have provided below. I look forward to hearing your response and I thank you in advance for your consideration. Again I am not very keen on this method because often are not you will be greeted with a rather hostile response, this is mainly because Farmers and landowners are often very busy. However, if you’re full of confidence you could use this method. I suppose it’s a little bit like cold calling in sales. A numbers game. You could do a search on Google, or Yell.com get the telephone numbers of your local farms and give them a call. Probably the most effective way of gaining permissions but for this method, you’re going to have to have confidence. You should be aware though that you could be greeted with a hostile response. I’ve had landowners tell me to clear off or slam the door shut in my face. It’s a good idea to take some of your finds with you if you have some to show the farmer. This can arouse curiosity and be a good talking point. Be polite and do not be pushy. If the landowner is busy then you could leave your contact details. When metal detecting on someone else’s land it is possible that you could recover some finds of value. So who does the find belong to? If the item is sold how is the money distributed? Who owns what you have found? In theory, anything found on the landowners land belongs to them. Regardless of whether you made the discovery. That being said the usual practice is to share and most farmers and landowners will be happy to agree to this. It is a good practice when a landowner gives you permission to have a small contract in place. This contract explains the terms and procedures between you and the landowner in the event of you finding an item, or items of value. Here’s an example and template of a contract between you the metal detectorist and the landowner. hereby grant a detectorist licence to (name)______________________________ (hereinafter called the ‘licensee’). licensee the right to enter the said land (which land is called the licensed area) and subject to the conditions herein to search for treasure, metals, buried coins, and artifacts. so far as the licensee may validly do so, at all times to keep the owner/occupier effectually indemnified against all actions or proceedings, costs, charges, claims and demands whatsoever, which may be made or brought against the owner by any party in connection with this license or any matter or thing done or purported to be done in pursuance thereof. The licensee shall not assign or part with any rights granted by this licence in relation to the whole or any part of the licensed area or grant any sub-licence in respect of any such rights. If there shall be any breach or non-observance by the licensee of any of the terms and conditions of this license, the owner/occupier may revoke this license, and thereupon the same and all the rights granted shall cease and be determined with or without notice by the owner/occupier and immediately on being requested to do so the licensee will vacate the land or part thereof. Any material items discovered prior to such events so arising will maintain possession of the goods with agreed independent person/authority until such time that disputes of just cause for premature license revocation are settled. The value of any objects will be determined by agreement between the parties named herein or by sale for the highest available price or by an appraisal by at least two independent persons jointly selected. Thereafter payment of any monies due to either party to this license must be made upon the sale of said objects, or within a reasonable period following an evaluation and prior to any sale where the purchasing party seeking sole ownership may obtain the necessary funds in payment to the other party. I personally, upon completion of my day out metal detecting take my finds to the landowner. If they are interested that is, you will be amazed at how many couldn’t care less what you have found. I like to give the landowner the chance to keep some of the items I have found. This builds trust and respect between you both. Obviously, if the item is of substantial value you will discuss how you both want to proceed. If you are a history buff like myself sometimes you will want to get a valuation of the item you have found and offer the landowner half of its monetary value and then keep the item for your collection. Researching land & your metal detecting permissions. When you get permission from a landowner to metal detect on their land it is very exciting. You’re going to be eager to get out there. However, sometimes you may have to wait. I use this time to research the land. You will be amazed at the exciting things you can find about the local history and even sometimes the history of the land. It’s also a very beneficial process and could help you locate the position of old pathways that no longer exist on the land, buildings and more. There are many ways you can approach researching land and there are many tools on the internet to help you. If you have a PC or mobile device you are going to want to download the Google Earth software. This is one of the most valuable tools when you are researching your land permissions. Google Earth allows us to have a different view of the permission or land you are researching. When we are on the ground it’s hard to see certain clues. It also has a nifty little feature which allows us to view the satellite image of the land and go back in time viewing older and alternative images. When viewing land in the satellite mode it can sometimes reveal the shapes of where old building use to exist or old footpaths. Things that usually would not be seen with the eye while on the ground. Combine Google earth with Old Maps and you can investigate further. There are a couple of websites which feature old maps. They have scanned hard copies of old maps some going back as far as the 1500’s. Enter the location in this website that you wish to look at. You can use grid references, postcodes, and coordinates. The website will then present you with maps that are available for the location you have entered. Click one and take a look. The maps are full of information and can include things that no longer exist like footpaths, buildings, moats etc some of these may have been on the land that you have permission to metal detect on. It can also give great clues as to what the land was used for. You can use the Google Search to research the history of a town, village or city that your land is located in. Google brings a wealth of knowledge and history to our fingertip and can provide many vital clues to the land you have permission to search on. The locals will often be very useful when researching land. Especially the older generation. Some of them will have lived there for decades and perhaps their parents did also who passed on information. Local Facebook Groups are also a fantastic place to find out information, most villages, towns, and cities have a Facebook group where people come together to discuss events, history and local politics. Make a post in one of these groups and I am sure there will be many that will give you lots of interesting information. The Archeology Data service has a fantastic website found here. It includes a search tool which you can use to type in keywords. For example, the name of streets, the farm name, the name of the town, village or city your permission is located in. The Archeology Data Service database will present you with all of the recorded archaeological and historical finds that have been made nearby. Sometimes the research can be more exciting than the actual dig itself. I once researched a permission to find out a huge amount of history about the land. The land once had belonged to the brother of Lady Godiva, the Sheriff of Lincoln. I had read stories and built up a huge story in my head about the things I was going to find on the land. Only to get there and realise that it had also been used as a site for fly-tipping much to my dismay. On the flipside, I have researched land and found the location of old footpaths which no longer exist and been able to focus my hunt around certain areas making the day much more productive and increasing my find rates. So research can really help. Even if it doesn’t I assure you that you will have fun in doing it. Do I need insurance for metal detecting? There is no legal requirement for you to have insurance. However, I would still insist you take my advice and ensure you have it. Lots of things can go wrong when you are metal detecting and for your own protection you should be covered by insurance. The type of insurance you will need is called Public Liability insurance. This type of insurance will cover you against scenarios like leaving a gate open at a farm and all of the farmer’s livestock escaping, Causing damage to a power cable or gas pipe when digging, or damage to property or land in general, along with many other things that may go wrong. If you call up your insurance company and try to get insured with PLI you probably won’t get very far and they won’t be able to offer you a policy. There are 2 ways that I know of that will get you fully insured with public liability insurance, both of these ways are full of other benefits too. The most popular way of getting insurance is to register as a member with the NCMD. To become a member of the NMCD you will need to visit their website. Fill out a form and make a payment of £8. Once you are a member you will be insured up to £10 million and covers both the UK and organised metal detecting events abroad. The NCMD is the National Council for Metal detecting formed in 1981 and made up of a body of elected volunteers. They provide a voice and representation for the hobby in all political matters. They have gained government recognition as the number one organisation that represents detectorists and the hobby of metal detecting. It costs just £8 per year to become a member of the NCMD and has many benefits. You gain representation at local and Government level in all matters that are metal detecting related. You’ll receive a colour newsletter at least 3 times a year highlighting all of the latest news and information. An NCMD membership is also required by some clubs for you to attend and participate in their organised digs. The second way to get yourself covered by insurance for metal detecting is by becoming a member of the FID. There are no acceptance requirements, they will allow any responsible metal detectorist to join their organization. To become a member of the FID you’ll need to fill out the form at their website, include a photo of yourself and pay the membership fee of £13. The FID, also known as the Federation of independent detectorists are a metal detecting organisation. Similar to the NCMD. They provide detectorists with insurance and accreditation. Again to join this membership scheme there are no requirements. They just ask that you follow the detecting code of conduct and are responsible. The membership scheme currently costs £13 a year and is just £4.50 for each year’s renewal. The benefits of becoming a member of the FID include an instant cover of £5,000,000 public liability insurance, a quarterly newsletter keeping you up to date with the latest news and legislation and a support network. To join you will need to fill out the form on their website along with sending a picture of yourself and pay the membership fee. You can join the FID here. It is recommended that you join one of the notable membership schemes in the UK for metal detecting. These memberships are very low cost and instantly give you credibility, they show that you are serious about your hobby. Not only that they also provide you with public liability insurance. These memberships can be the difference between being accepted by a landowner to metal detect on their land. Read the full metal detecting insurance article here. Some may think it’s as simple as just swinging the detector side to side and that’s all there is to it however that is not the case. Not if you want to achieve maximum performance and increase your find rate. To achieve this you need to learn the basic operating techniques. The core technique you will need to practice is the sweep. The action of moving the search coil at the bottom of the detector from side to side while sweeping across the ground. 1. In each sweeping movement from side to side, you slightly overlap so you do not miss anything beneath the ground. 2. Always try to ensure the search coil is parallel and as close to the ground as possible this will keep maximum depth. To begin with, you will probably find that you lift the coil at the end of a sweep this will cause a loss of depth and could quite easily play a part in missing targets. 3. While you are sweeping ensure you are listening carefully. Do not just dig loud signals. A quieter signal does not mean a bad target it could just mean it’s deep and small. 4. Sweep slowly do not try to rush. However, some metal detectors will require you sweep a little faster. Refer to the manual for advice. 5. Avoid banging the metal detector into piles of earth, rocks or objects. This can give a false signal. Once you have mastered the sweeping technique you’re going to need to know the optimal way to recover a target. The initial method I want to talk about is the “plug” technique. This method is for pasture ground. Cut a 3 to 4 inch round plug in the turf or sod. Remove the plug and place it to one side away from the hole and metal detector. Pass your metal detector over the plug. If you hear a signal then the target is located in the plug. If you do not hear a signal then the target is still in the hole that has been left. Recover your target from either the plug or hole. You can then put the plug back in the hole and cover your mess. The downside of this method is that there is a good chance that when you replace the plug, grass side to the top, that the grass could consequently die as it has been cut. An alternative method to this is to create a “trapdoor plug” this is very similar to the above process but you will be leaving one side still connected to the earth. This will allow you to pull the plug up like a trap door in the ground. Once you have recovered the target you can then close the “trapdoor” plug. As the grass has not been completely removed from the roots you have a better chance of the grass staying alive and not dying. TIP: After recovering your target from the hole or plug. Always rescan both with your metal detector. There could be more targets in the same hole or plug. The following method only works when using a Double D metal detecting search coil. When the target is detected along the imaginary sweep line, draw a line at right angles to it, using the centre of the coil as the focus point. Turn 90 degrees and move along the line that you just drew until you can hear the target signal again. Again, draw an imaginary line focusing on the centre of the search coil. Where the lines meet should be where the target is pinpointed. This method will no doubt take some practice, each metal detector is slightly different. It’s a technique that you will master over time. I am only going to briefly touch on this subject because I feel it falls more into the advanced metal detecting category than the beginner’s guide. Beach detecting is still a perfect day out for the beginner. You should be aware though that without the right equipment you could find yourself rather frustrated if you go near the “wet sand”. Many metal detectors will start to malfunction and give off false signals. So you will need a metal detector that has been designed for this purpose. A handy tip when beach detecting is to get yourself a scoop. This will help you recover your targets much more efficiently. The scoop essentially acts as a sieve. Allowing you to scoop the sand where the target has been located and filter the sand and small pebbles from it leaving whatever metal item you have found in the bottom of the scoop. Do your research before you buy a metal detector if you are going to be mainly beach detecting and ensure that it performs well in these conditions. Not all metal detectors are waterproof either. Most of them have waterproof coils. If you want to metal detect in the water you will need to ensure that your detector is submersible and can be used for this purpose. Research before you purchase. If you require more information on UK beach detecting or detecting in water some good information can be found here. How to clean your metal detecting finds. Before we talk about some cleaning methods for your finds I want to say that cleaning can cause damage which is irreversible. Some like to clean all of their finds while most prefer to just softly brush away the dirt and leave the find as it is found. This ensures no damage is caused. That being said here are some of the preferred methods for cleaning metal detecting finds. A large amount of the items you recovered from beneath the ground will be made of iron or steel. If you want to preserve these items you will need to protect them. Iron rusts and in turn rust will eat away at your item. Rust is caused by moisture and oxygen. If your item doesn’t have a great historical value then you can remove and clean some of the formed rust with a wire brush or a fine bronze wool and mineral spirits. If your item has a historical value you should store the item in a place with no oxygen or moisture this will slow down the rusting process. A protective coating can be applied to your item including wax, oil-resin or a clear plastic spray. These can also help prevent further rust. If in doubt contact your local FLO for advice. To clean Copper and brass coins or artifacts you will need to give more care and attention. Cleaning your artifacts or coins is at your own risk. I personally do not clean my finds with any chemicals. Others like to clean their finds, if you fall into this category then the following methods are often recommended or discussed. For a coin or artifact that has suffered a basic and simple amount of oxidation a homemade treatment can be made using denatured alcohol, distilled water and precipitated chalk. Mix the precipitated chalk with two parts denatured alcohol and two parts distilled water until it forms a thick paste. You then apply this to the coin or artifact. For a coin or artifact that has suffered heavy corrosion, you can use a mixture of lemon juice and water. Let the item soak in the solution for 5 minutes at a time, each time you remove the item gently rub away the corrosion. After you have removed a lot of the corrosion you will need to rinse thoroughly with a mixture of water and baking soda. This will neutralise the acid and stop further damage. Again I give this information to you to use at your own risk. You could potentially cause permanent damage to your item using these methods. Silver is more attractive with its natural patina I feel so I simply rinse in warm water and dab away dirt. More intrusive methods of cleaning silver artifacts or coins are as follows. Take an old pan or bowl and add some washing soda to distilled water. Take 2 large sheets of tin foil and crumple them up into a ball. Place these in the liquid. Place your item in the pan or bowl and leave the object to soak. This should remove some of the tarnishing or dirt. Commercial cleaners are also available for cleaning silver. You can purchase a good Silver dip from your local jewellers or from Amazon or eBay. There are a few different methods for cleaning silver. One of the best ways to treat sterling silver is: use an old aluminium pan or bowl and add an ounce of washing soda to a pint of distilled water. Then place two sheets of crumpled aluminium foil into the liquid. A tarnished look is normal on these items, they are darker in colour. I won’t recommend any cleaning for items made of these metals as I once tried to clean a musket ball and completely ruined its aged look and turned it into a simple ball of lead. If you are lucky enough to find Gold while out with your metal detector then you will see that Gold comes out of the ground pretty much the same way it went in. Aside from a little soil or dirt which will come of with a gentle rinse in soapy water. Gold is very delicate DO NOT under any circumstances try to clean gold with any other methods. On your head be it. You may cause irreversible damage and significantly reduce its value. What do I do with my metal detecting finds? Anything that isn’t classed as treasure and you have permission to keep from the landowner is yours to do as you please. Some choose to create display boxes, some organise into packets with their research of the item, some donate to local schools or museums. It’s completely up to you. To be sure you follow all the laws and regulations then you will need more information on what you can and can’t do with your finds. Who they belong to and how you should proceed after recovering a find. Metal Detecting Laws in England. What is the treasure act? The Treasure Act defined in 1996 is an act that is set out to help us identify what items need to be declared the correct authorities. It’s a legal requirement and Law that is in place to ensure you the detectorist reports finds to the local coroner within a 2-week timeframe of when the item was found. To do this you would contact the FLO (Finds Liaison Office). An inquiry by the coroner will then be made which will determine whether you have found something which will be classed as treasure. IF you have found an item deemed as treasure then you must give the first refusal to a museum. The price and valuation of the item will be set by an independent team of valuers and experts. This ensures the valuation is fair. If no museum wants to purchase the item you will then be allowed to reclaim it. Even after I explain what is classed as treasure it may leave some of you a little bewildered and unsure. What is classed as treasure still has me confused. So the only way to be sure is to contact your FLO if you are in any kind of doubt. Two or more coins with at least 10% precious metal content found in the same location that is of at least 300 years in age. However, if the coins contain less than 10% precious metals then there must be at least 10 coins. Small groups of coins that may have been dropped or lost from a pocket or a purse perhaps. Items or coins that are less than 300 years of age that are made up of precious metals that have intentionally been hidden with recovery in mind. Landowners by British Laws have the ownership of any historical or archaeological items found on their land. This is why a contract before you start metal detecting on a permission is very important. Anyone who detects without permission or illegally on scheduled or SSSI land risks imprisonment, confiscation of any finds, ASBO orders and large fines. Anything else that you may recover that does not come under the treasure code is for you and the landowner to do as you please. More the landowner because theoretically, they belong solely to them. So be sure to discuss what they want to do with the finds. Most of my permissions landowners have let me keep the majority of my finds but sometimes they like to keep a memento. SSSI stands for a site of special scientific interest. These areas are seen as having a very high conservation value. This could be for numerous reasons including geological and physiological. Land can be designated with an SSSI because of the presence of a rare species of animal or because of rare physiological features. They are put in place to protect the land. It is forbidden and against the law to metal detecting on land that has been given this status. A scheduled monument is a nationally important historic building or site that is given protection against unauthorised change. There are currently over 20,000 scheduled monuments in the UK. It is illegal to remove items from sites or buildings given this status without the permission from “Scheduled Monument Consent” and for metal detectorists, this is near to impossible. A voluntary programme also abbreviated and known as the PAS. Run by the UK Government with the purpose of recording finds made by the public. The PAS started in 1997 and covers the UK England & Wales. Their primary focus is on detectorists who recover historical or archaeological artifacts and coins and they record their finds. The general public can also report their finds to the PAS. Including prehistoric and non-prehistoric meta and non-metal. What is a Finds Liaison office? The Finds Liaison Officer also commonly abbreviated and known as the FLO is a qualified and experienced person who can analyse, research and examine historical and archaeological finds. The FLO exists as a point of contact. They are there to help you record, examine, research and analyse your finds. They will give you more information on the date, material and the finds purpose etc and they will also ensure that your discovery is recorded in the correct way. The Finds Liaison Officer is qualified enough to analyse, research and examine the find and then give the finder more information on it. In order to maintain a healthy relationship, this Liaison officer builds bridges between detectorists and archaeologists who otherwise sometimes clash. Because the PAS and FLO exist many historical sites have been identified since the start of the scheme and they have made many contributions to our local knowledge of history. The metal detecting code of conduct is a practice that all of us as detectorists should try to adhere to. It helps to keep a good name and reputation in the detecting community. It also keeps us as individuals away from legal problems and general trouble. No Trespassing – All land is owned. You should always obtain permission from the landowner or tenant before you take your metal detector on someone’s land. Protected Sites – Always check before you metal detect on land that is not marked as a scheduled monument or an SSSI (Site of special scientific interest) There are laws in place protecting lands marked in this way. You can use http://magic.gov.uk to check your land isn’t scheduled. Handling & Care – It is important that you take care of and store any historical finds in the correct way to ensure no damage comes to the item. A good place to learn more about handling & care of archaeological finds can be found in the small pdf file here. Caring for the ground – Ensure any holes that you make are backfilled and you use the correct tools. Try to be as neat as possible and cause as little disturbance to the land as possible. Recording Finds – It’s good practice to record your finds and their locations. You can achieve this by using the GPS on your phone while on the land and recording the grid reference. Respecting the country code – Always respect the country code when you are out metal detecting. Ensure you close gates behind you, do not damage crops, try not to disturb livestock or animals, clean up after yourself, remove litter along the way, never rebury junk you dig. Report your finds – You should always report any historical or archaeological find. You should report them to the landowner and then to your local FLO and the Portable Antiquities Scheme. The information then can be passed over to the local historic environment record. Adhere to the treasure act – Follow the treasure act that we discussed previously. If you are ever unsure as to what is seen as treasure your local FLO will be able to assist. Seek advice – If in doubt you should seek advice and information from an expert. Explosive devices should be reported immediately to the Police or Coastguard. Switch off your equipment and do not remove or tamper with the object. If you suspect you have found human remains these should also be reported to the police. Some of the above are legal requirements but some are not. They are more of a guideline that is in place to ensure the public can enjoy any historical finds we make, to keep us and the general public safe, to keep our landscapes looking good and to create a good reputation for the metal detecting hobby. Identifying your metal detecting finds. With the above information digested. You could choose to try and identify your metal detecting finds yourself. For me, this part is again just as interesting and exciting as being out in the field. You can learn so much at this stage of the hobby. To identify your metal detecting finds there are many ways you can proceed to accomplish this task. Facebook Groups are a fantastic way of getting clues or even an identification on your find. Beware though although very helpful, not always right. You could take clear pictures of the metal detecting find you are trying to identify and upload it to one of the many Facebook metal detecting groups. Be polite with how you word your post and always remember your manners. Sometimes I will type in what I think the item is and trawl through hundreds of Google images until I find something similar. This doesn’t always work though. So I will go to the Google search and for example, I am trying to find out about a belt buckle that I have found. I will type in Belt Buckles through history. A few positions down in the search results is a great PDF file with all different shapes and sizes of belt buckles. This gives dates, purpose and much more information about many belt buckles. This is of course just an example of how to use Google for identifying your finds. I’m sure you will find your way. If you have plenty of time you can use the Finds.org.uk database. Here there are over 1.3 million objects and artifacts. So it may take a while to find something similar to your find. Type in a rough description of your item into the search box. For example Brooch. Press enter and you will be presented with all of the brooches found. Try to find something similar in style and if you’re lucky enough to find something similar to your item you can then find out more information. This should only be used as a clue and in conjunction with one of the other methods of identifying your metal detecting find. You should be aware that over the years styles and trends have repeated themselves. I once found something I was sure was Roman, it turned out to be a Victorian reproduction. Your local FLO (Finds liaison office) is your best friend. They will help you identify your finds. If you’re struggling you can always contact them and send images to gain their expert knowledge and opinion. If you like reading there are many books available to purchase or to lend from your local library. It would be a good idea for you if you are serious to get the latest copy of the Spinks Coin Collectors book. This can be invaluable when trying to identify UK coins. There are books on just about anything you can imagine. So if you have a button, for example, you can do your research by looking in books on buttons. The metal detectors that I will now recommend for you the beginner detectorist have been subject to either physical testing by myself or extensive research and recommendations. They are all fantastic value for money and have proven themselves to be worthy and reliable. All of these metal detectors can be used with ease and will not take a degree to use. Each will no doubt enable you to make some very exciting finds. Read the full Top 10 beginners metal detectors article. The Euroace is a fantastic beginners metal detector, simple to use, built for European conditions and has all of the features you will need. My first metal detector was the Garrett Euro Ace and I still use it as a backup machine to this day. With over 200 5 star reviews on Amazon, it’s safe to say the Garrett Euro Ace is a great choice as a beginners metal detector. Garrett not so long ago released some new models to update their ace line of metal detectors. The Garrett Ace 400i is a very similar metal detector to the Euro Ace but with the inclusion of a LED screen complete with visual ID numbers. Still very simple to use so perfect for the beginner detectorist it combines this simplicity with some advanced features to create a great machine. You can buy the Garrett Ace 400i new on Amazon below. A huge contender in the beginners metal detecting niche. The Teknetics Eurotek Pro is a budget metal detector that has impressed not only beginners but seasoned detectorists too with many owning one as a backup machine. They have managed to keep the machine nice and lightweight at just under 1.2kgs and appearance-wise, it’s sleek and innovative. It’s an absolute bargain price especially for the performance power, it also discriminates against iron well. For a beginner, it is simple to use and has absolutely everything you need in a metal detector. You can buy the Teknetics Eurotek Pro below. Minelab created a range of metal detectors called the X-Terra and in my opinion (although the later models are a little more advanced) are worth the recommendation in the beginners metal detectors category. There are 3 models the Minelab X-terra 305, the 505, and the 705 so one for everyone’s budget. Of course, the more that you pay the more features and power you will receive however that being said all 3 are fantastic machines. All models have a digital LCD display with numeric target ID. The target ID will help you understand more information about the target you have discovered. Not as simple to use as the previously mentioned beginner’s detectors, Minelabs X-Terra machines have quite a few internal menus. So you will need to dedicate some time to get used to the functions and buttons. Lots of positive reviews can be found across the web and detecting community. I have personally owned the Minelab X-Terra 705 and made lots of great finds with it. What is the best pin-pointer for metal detecting? The following pinpointers have earned their reputation as the best pinpointers. Perhaps now the most popular of all the pinpointers for detecting, aptly nicknamed the “carrot” the Garrett Pro-Pointer AT is invaluable. Because they are small handheld devices when you’re out in the field it’s not uncommon for you to misplace your pinpointer. So what better way to make it stand out than to make it bright orange! 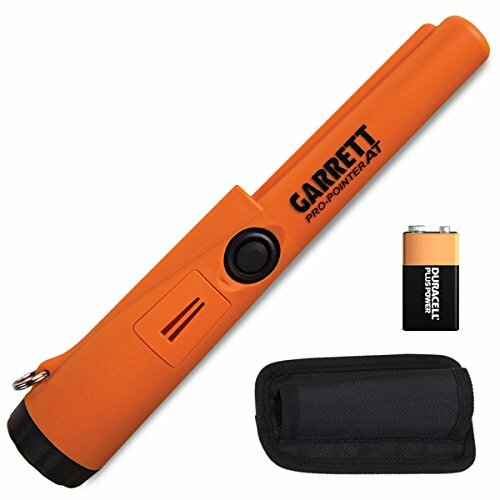 The Garrett Pro-Pointer is completely waterproof, includes a LED flashlight for enhanced visual potential, and is operated by a single button so is very simple to use. It includes a few more advanced internal features too like auto-tune. Not cheap to own but the Garrett Pro-Pointer AT is probably the number pinpointer. Read the full Garrett Pro-pointer AT review. Perhaps not the most attractive of pinpointers the Whites Bullseye II offers an alternative for those working to a budget. Very simple to operate with one touch control, a small light and a choice of audio or vibration alert. You can buy the Whites Bullseye II pinpointer below. What is the best spade or shovel for metal detecting? It’s each to their own with this question. Some people prefer a smaller shovel and some suffer from back problems so get on better with something larger. There are shovels for everyone though and every budget. Here are some noteworthy and recommended digging tools for metal detecting. 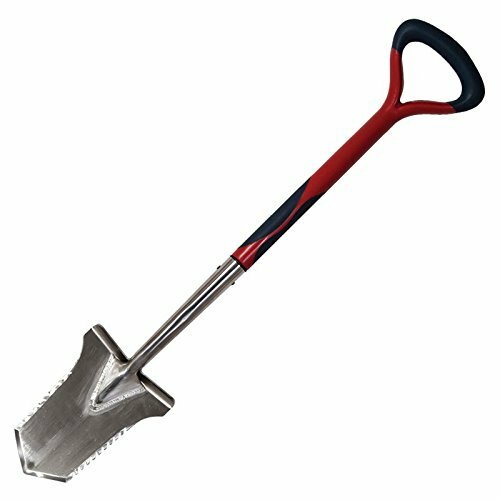 Draper Mini Shovel with Rounded Head. I’ve personally been using the same one for the past 4 years and it’s never let me down. It has a fibreglass shaft which makes it nice and light and a press steeled blade so it’s tough and durable. Draper has a good reputation in the tool world and this shovel is small, compact and lightweight. I couldn’t be without it. You can buy one here. A fantastic spade for detectorists is the Evolution Spade. It can really help with those that suffer from back problems or continuously crouching down. It’s made of stainless steel and is welded with stainless welds, it’s safe to say it’s built to last. Has a toothed blade for added effectiveness when cutting the ground and a footrest to assist you when digging. If you wanted to keep the holes that you dig extra neat then Garrett has created just the tool. The edge digger allows you to keep the plugs you dig in turf small and tidy. The Garrett Edge digger is built to last a lifetime from the strongest steel. Approximately 3.1mm of pressed steel. It cuts through the hardest of grounds with ease. It comes complete with a handy sheath so you can attach it to you. A welcomed digging accessory for the beginner metal detectorist. Read the full article on the best digging tools for metal detecting. Is it legal to metal detect? It depends on the country you are residing in as there are individual laws for each country. It IS legal to metal detect in the UK, providing you have permission to metal detect from the landowner. For a full list of metal detecting laws by country, this is a good page. The best selling beginners metal detector of all time is the Garrett Ace 250, that being said, it doesn’t mean it actually is the best performing. 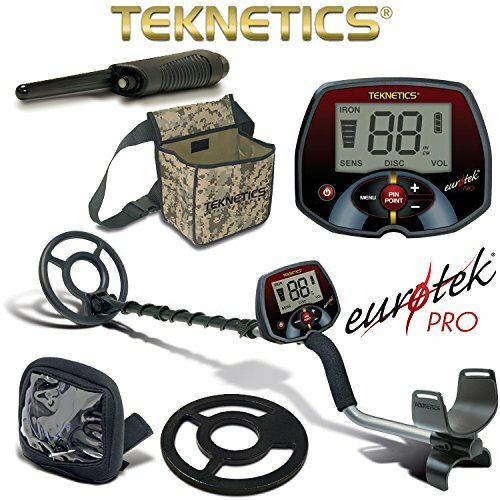 I believe the Teknetics Eurotek Pro with DD coil is the best metal detector for a beginner. What is the hobby of metal detecting called? What does a metal detector find? A metal detector will find anything that is metal. They will detector iron, copper, aluminium, brass, nickel, tin, silver, bronze and gold. In most metal detectors there is the option to discriminate against certain types of metal by changing the discrimination settings. Can I find gold with a metal detector? Yes, you can find gold with a metal detector, the chances of finding gold are increased with the choice of metal detector. Some metal detectors are manufactured and fine-tuned to find gold specifically. For example the Garrett AT Gold. When metal detecting the frequency of your metal detector will change your chances of finding gold. The “sweet spot” will change with the conditions of the ground and the metal detector you use. Around 15khz is the optimal setting to find gold. That being said I believe the best metal detector for gold is the Garrett ATX. How much does it cost to buy a metal detector? What is a PI metal detector? A PI metal detector is a pulse induction metal detector, these are less common than VLF metal detectors. A PI metal detector sends a powerful, short burst of current through the coil wire. In effect a pulse-like current. The PI metal detectors can us a single coil to transmit and receive signals and can have up to three coils working simultaneously together. UK & European Metal Detecting Forum – A Forum for detectorists to discuss anything and support. I hope you have found some of the information in this metal detecting guide useful and my number one goal when writing this was to assist you getting out there and enjoying this wonderful hobby. As I said I was a beginner once and had a lot of questions that I wanted answers for. I’ve tried to put these all in one place. I am by no means a writer or author so I apologise if any of this guide was confusing or if the grammar wasn’t perfect. If you feel I have missed out anything important then please let me know in the comments. The Metal detecting hobby is addictive and has so many benefits. I truly wish you the best and hope you are one of the next big hoard or treasure finders. Detectorists Find The Ultimate Roman Gold Hoard…Or Did They? Hello my name is Steve I am considering getting started into the metal detecting scene & have just read your guide & found it very informative but one thing has entered my mind if a Detectorist picked up a signal & started digging & found an unexploded bomb ( god forbid ) how can the detector or the detectorists know this , I’m sure this question must have cropped up many times but being a learner I’m obviously interested in the answer, many Thanks Steve straw Leven East Yorkshire. Could you please send me an electronic copy of the guide.